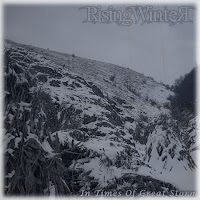 Formed in January 2009, with the idea of playing rock music, Rising Winter has achieved much in past couple of months. From its very beginning band was meant to be international project, a collaboration of musicians from around the world. Line ups came and went and recording became more or less a problem. Also due multiple composers band had too much space between sounds of the songs. From 18 composed songs, only 10 were selected for debut album “In Times Of Great Storm” which is finished recording and its being slowly prepared for mixing. Band decided to release the album as internet release. Concerning the band line up, band is open to collaborate with session musicians but there are four permanent members in line up at this time – Nordawn, Dušan, Mathijs, Igor and Marko. The line-up is working on the second album whose recording is expected to start in October 2009. Much more work will be dedicated to it. Meanwhile work on small EP called “Svet U Ogledalu” is in progress. EP will be sang in Serbian and also available for free download when completed.